Roku's streaming players are our favorites, and the company's latest generation of players just makes a good thing better. Roku's current lineup is faster, with more capable remotes that — finally — include power and volume controls for your television, so you don't need a second remote cluttering your entertainment center. The software is getting an update, too, making it easier for cord-cutters to watch to broadcast television. Express ($30): The ideal value streaming media player, the Express is five times faster than the last version for zippy navigating. It streams in HD and includes a basic remote without the voice controls (or power and volume controls) found in higher-end models. But considering this gadget costs $10 less than the Amazon Fire TV Stick and $5 less than the Chromecast, it's the best value you'll find in streaming. Express Plus ($40): The Express Plus is simply the Express with composite cables to connect to older televisions — something you won't find on many streaming players. Streaming Stick ($50): This is the streaming device we'd recommend to most people who don't need 4K streaming. It now comes with a voice remote — which used to be limited to higher-end Rokus — that has the new power and volume buttons. Streaming Stick Plus ($70): For an extra $20, the Streaming Stick Plus offers 4K HDR playback and four times the wireless range of last year's Streaming Stick. That makes it ideal for any TVs that are far away from your router, whether you need 4K or not. Price-wise, it costs as much as the Amazon Fire TV, which also includes 4K HDR playback and a voice remote. Which one you'll want to buy depends on which platform you like better: Amazon offers easy integration into Amazon content if you have a lot, but Roku works with Amazon, too, and has access to a much larger content library. The 4K Chromecast Ultra is also priced at just $70, but without a remote (much less a voice remote) it's harder to recommend unless you particularly want to trade remotes for your smartphone. Ultra ($100): Roku's top-end streamer is much like its last-generation counterpart, offering 4K HDR streaming as well as a voice remote with a headphone jack for private listening. The latest version includes a remote with volume and power buttons plus a $30 price cut. Though it's a pretty minor price cut — and a pretty minor upgrade — it gets the Ultra closer to Fire TV ($70) and puts it well under the Apple TV 4K ($180), both of which have fairly similar features. However, it's Roku's software and content selection that's always made the platform stand out. While Amazon and Apple are trying hard to catch up, Roku's ability to search thousands of content sources at once makes it simple to find anything you want, wherever it is. And so the software updates in Roku OS 8 — included with new devices and to be rolled out to many older devices — may be more interesting than the players themselves. Roku's guide and search features will now help you navigate over the air broadcasts, which is going to be a very handy feature for anyone who's cut the cable cord and uses an HD antenna to watch local network channels. (And if you have a Roku that supports it, you can use headphones to listen to over the air content via your remote.) For those of you who haven't cut the cord yet, Roku now offers a single login to your television provider that can unlock up to 30 stations you would otherwise have to log into one at a time. Though it doesn't yet support every provider, Roku plans to add more — a big convenience. Roku OS 8 will be rolling out to players starting this month, with rollout to all Roku devices by the end of the year. 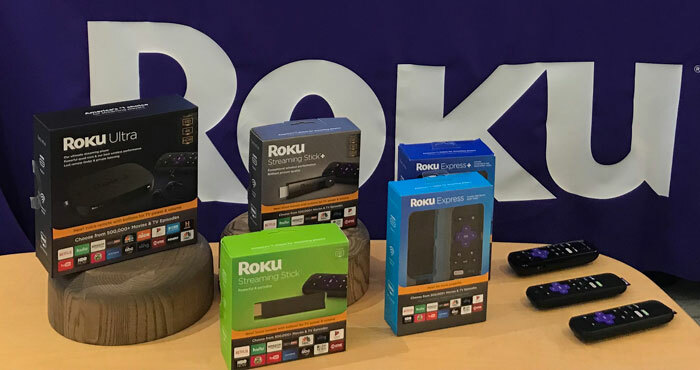 New Roku devices are available for pre-order now and will ship on October 8.